Things are on the up for Sophie Morgan. She fended off vampires on a holiday to Antwerp, escaped them on her return in Coventry, stabbed her neighbor and is slowly rebuilding her life in her hometown of Bethel. Running the family property business may not be lucrative but she’s happy. Since returning to Wales, she has only had to kill one vampire and thanks to the linoleum on her kitchen floor, even that was an easy clean up. Then a mixed blessing arrives in the form of Mickey Kelly, the barman she had a brief flirtation with in Antwerp. After being missing for months, he arrives on her doorstep one rainy night. His brother has been murdered and vampires are coming for her. Little do the pair know that Sophie’s estranged father is among their numbers. He’s coming for his daughter… and he’s not the only one. Death in the Family is the long awaited sequel to Relative Strangers, with some familiar faces as well as some new ones. Will Charles Ferrers, Sophie’s former adversary, pursue her to South Wales and if so, to what end? Who is the mysterious man following her? Will Sophie and Mickey finally consummate their relationship and where will it lead them? Or will there be more than one new man in her life? 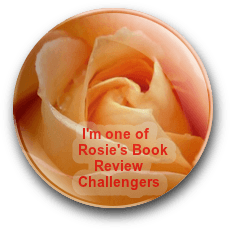 Find out how our practical, resilient, if not slightly insecure, Sophie deals with a whole new range of challenges in the second in the ‘Sophie Morgan vampire series’. This time she has bigger problems than vampires to deal with. This time she has family visiting. 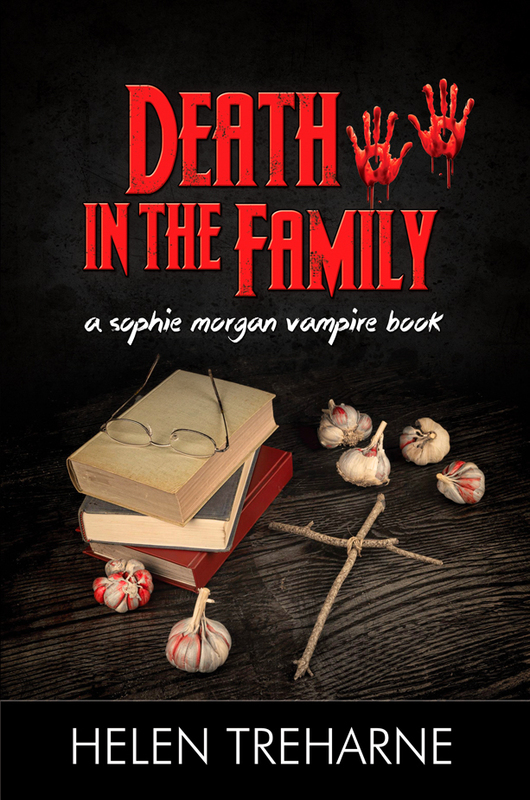 Death in the Family is the second Sophie Morgan vampire book and will be available from Amazon from 14th February – the perfect valentine gift for the vampire slayer in your life! It is available for free NOW for Kindle Unlimited customers. 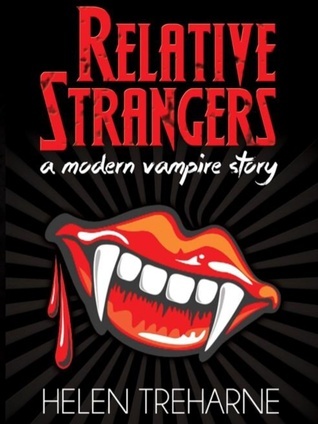 Relative Strangers is the first in a new vampire series with a distinctly British flavour, but which will appeal to everyone. 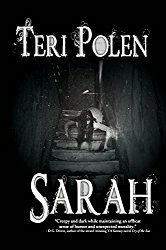 Reviews call it “a vampire tale with bite”, with “brilliant characters that draw you in” and a very fresh take on the genre. Read it now to find out reviewers are raving about. I tried to scream, but I couldn’t, the arm was curled so tightly around my throat it was making it impossible to breathe. Breathing through your nose isn’t easy when you’re in a blind panic, but I tried anyway. Cold fingers were clamped over my cheek and the side of my mouth. I tried to move my jaw to at least get a bite of my attacker, but it was impossible. Why didn’t I go back with Mickey? Please Mickey, come back. Anyone, help me, please, please. As we struggled in the confines of the doorway, I hoped that someone would come to my aid. Bars and nightclubs would be shutting their doors soon and that would surely mean someone would have to come by soon? All I had to do was stay alive long enough to be found. Surely Mickey would see me soon? But why would he? He would probably assume that I was totally unhinged by now and that I’d wandered off somewhere. My thoughts were racing as I struggled and my head was throbbing. Then the searing pain ripped through my body. I couldn’t tell what was happening, but I knew it wasn’t good. First, there was an ice cold stabbing sensation in my neck. Then came the burning, a river of heat surging through my veins. I’d never felt anything like it before. Coherence was terminated the instant I felt my flesh tear open. Blood poured down my neck. I wasn’t sure what weapon he could be using, but I could feel his nose resting on the side of my chin, his mouth maneuvering itself around my neck, moving in a circular gnawing motion. Oh my God, I’m being bitten. Someone is actually biting me. What next? This cannot be happening? This can’t be real. What the ***? I can’t die like this. Rachel hadn’t felt so good in years. The colours of the world were vibrant and laid out before her like a beautiful carpet, a glorious vibrating kaleidoscope of nature. Birdsong echoed in her ears like a concerto and the golden welcome of the rising sun made the world look like a furnace, molten lava pouring over it all. She sipped the coffee that she had made. It tasted bitter and she spat it out over the perfectly dressed window sill. She’d made it out of habit. Ferrers had instructed her to appear as ordinary as possible. The routine of everyday existence would eventually help her contain her urges, or rather the singularly dangerous one, the one to kill. So far, it wasn’t working. Perhaps it was time to succumb to the hunger and to all the other suppressed desires now angrily bubbling to the surface. Her reflection in the window surprised her. She had half expected it to be absent. Her hair looked thick and luxurious; her eyes sparkled and the hazel flecks in her irises danced in the sunlight. It had been years since she’d felt this good, hell, maybe a lifetime, maybe never at all. She felt strong, powerful, and alive. Had she always looked this beautiful, she wondered. Had her new vampire state made her better, or only imbued her with a new found confidence? Either way, she liked it. She could feel every nerve ending in her body, everything performing in precisely the right way, like a well-oiled machine. It was magnificent. Every hair on his scalp stood to attention, every skin cell tingled, every neuron fired. Warmth spread across his chest. His heart pounded hard in his chest as she finally came to a halt before him, inches from his face. This was a new feeling – excitement maybe? He was aroused beyond his understanding, like the hunger of a starving man. She was stunning. Is this what real desire feels like, or is it the drugs? Had he ever felt this excited before? It was as if he had just been born, experiencing the world and all its sensory pleasures for the first time, all in one hit. The thought that he might not be able to perform under the drug’s influence flashed across his brain, but he shook it off; there was nothing that was going to stop him from having her. He didn’t care if they were in some dirty, a hundred people could walk past and he wouldn’t have given a toss. He would have her, devour her. The feeling was amazing. In addition to being the creator of the developing “Sophie Morgan” series, Helen is an urban poet and social commentator who can frequently be found ranting in the Twitterverse. She knew the degree in Sociology would come in handy some day! Helen lives with her husband, three cats, an entrenched tea addiction and an increasing collection of stringed instruments. When she’s not writing she spends her time daytime hours working in communications and volunteers for a feline welfare charity. She also spends too much time watching Supernatural and Buffy the Vampire Slayer. She also can’t be trusted near stationery and has probably had more come backs than Cher. You’re welcome, Helen – any time!